Our third year at the world-renowned South by Southwest (SXSW) Conferences and Festivals was our best yet. Thanks to the hard work of those in our office, as well as our partners, Blue Goji successfully showcased our latest endeavor: Infinity. 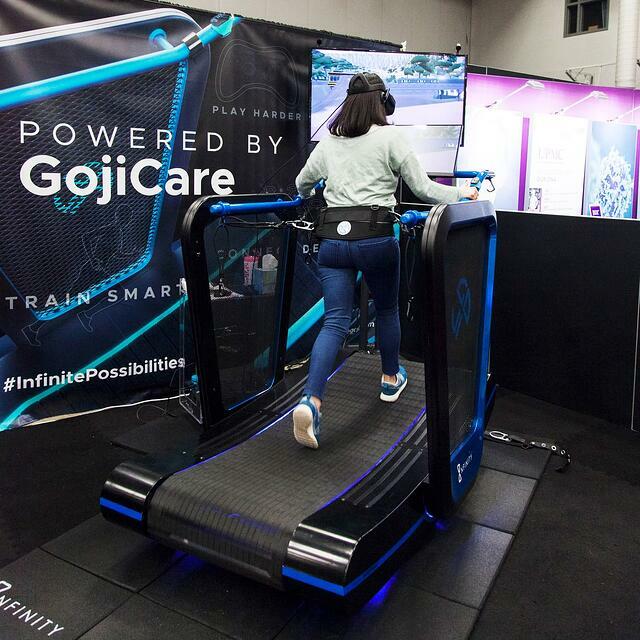 The brand new, state-off-the-art treadmill has been handcrafted for us by Woodway Treadmills, designed in part by M3, a local design agency that previously helped Blue Goji win a Red Dot Award for Goji Play controllers. The self-propelled treadmill features Woodway’s signature curve design, while incorporating our gaming technology. 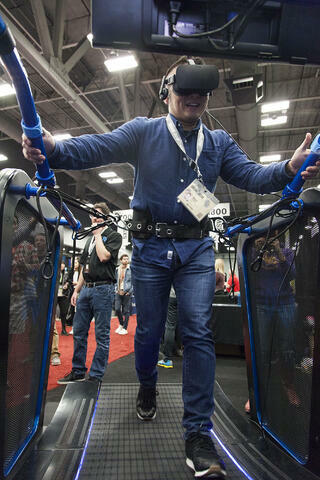 Additionally, the machine features parallel bars and a sensored belt, making the machine extremely versatile for high-end gyms and VR arcades, but also physical therapy and rehabilitation facilities. 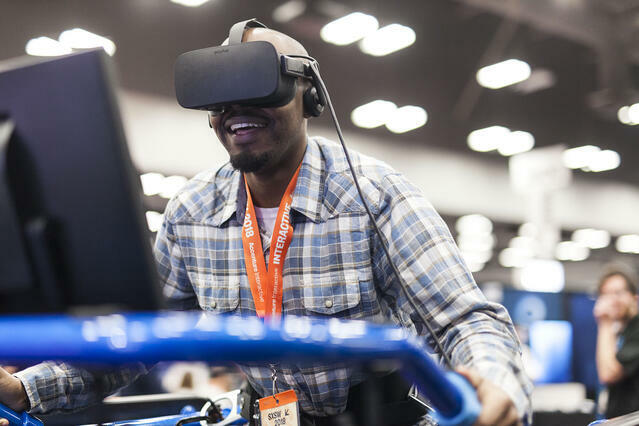 From March 11-14, Blue Goji exhibited Infinity at the SXSW Tradeshow, then continued to exhibit at the Gaming Expo, March 15-17. 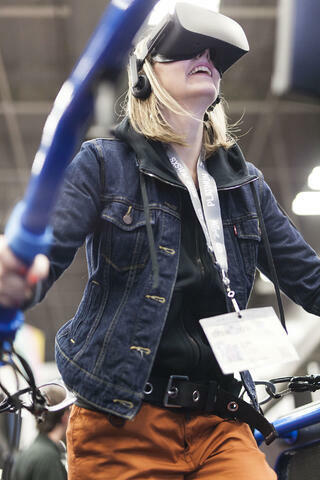 Throughout the week, we showed our specially developed game GoBikes. The treadmill and the game communicate to give you a truly immersive experience: as you go up a hill in the game, the resistance on the Infinity automatically increases to mimic the actual feeling. Vice versa, going down a hill decreases the resistance. The result is a one-of-a-kind experience at the intersection of gaming and fitness. Attendees participating in our demo ranged in age, size, gaming abilities, and physical fitness, yet all enjoyed their time. From young kids to business professionals, everyone had positive reactions. Several people exclaimed how they would work out more often if Infinity was available to them, and most people acknowledged that in a short time, they had pushed themselves further than they normally would on a treadmill. Others noted that they had no intention of running but once in the virtual world, they couldn’t help themselves. Overall, we received excellent feedback during our weeklong showcase. While we were demoing a working prototype of the Infinity, the completed version will be available early 2019. With the full version, games and experiences can be fully customized to clients’ needs and desires. If you’re interested in what the Infinity can provide for you or your company, get in touch with us at info@bluegoji.com. We're excited to see how the Infinity will impact the future of wellness. Our next exhibit is at IHRSA, where we are partnering with Woodway. At the time of publication, the expo is currently happening. Aside from the main showcase of the treadmill, we also began to show off Furiends, an AR game with bonus features in VR coming out this summer. More info to come on that within the next two months! Don’t miss our next company update by subscribing to the blog. For questions or comments, leave one below or tweet us. Be first to get updates about fitness and wellness! Subscribe to receive a message from us when a new blog post is published.